Salyut was a highly successful early space station. In 1979, Vladimir Lyakhov and Valeri Ryumin spent almost 6 months (175 days) aboard it; eight months later, Ryumin was back, having stood in for an injured cosmonaut. His companion this time was Leonid Popov, and they stayed just over six months (185 days). In this period of 20 months, had spent 12 in space, to become the world's most travelled human, with a total journey of 240 million km (150 million miles), more than 600 times the distance to the Moon. Salyut 6 weighed 19 tons and was 13 meters (43 feet) in length. It had two docking rings so that the resident cosmonauts could receive visitors in another Soyuz, or supplied from another unmanned Progress transporter. Salyut 6 had a volume of 90 cubic meters (3,000 cubic feet), less than one-third the space available in the US Skylab, and was very cramped when the two Salyut cosmonauts play host to a pair of visitors. Among the experiments on board Salyut 6 are furnaces for making ultra-pure metal alloys, glass/ceramic materials, and semiconductor crystals for electronics. Cosmonauts also tried to grow vegetables, including dill, parsley, and cucumbers. Salyut 7 and docked Soyuz T-14. Salyut was an early series of Soviet space stations of which seven were launched over a period of a decade beginning in 1971 with Salyut 1, the world's first space station. The Salyuts were intended to make human presence in space routine and continuous. As well as doing scientific research and spacecraft maintenance, cosmonauts tested equipment that would make space stations more habitable. In total, the Salyut ('salute') program involved 32 missions and cosmonauts from a variety of countries. The Soviet Union's guest cosmonaut program began in March 1978 when Soyuz 28 carried the Czech pilot Vladimir Remek to Salyut 6, and led to several firsts, including the first black person in space – Arnaldo Tamayo Mendez of Cuba. 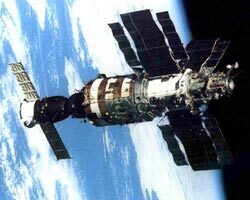 In 1986, Salyut 7, the last in the Salyut series, was replaced by Mir. In 1969, the Soviet space program was in crisis. While American astronauts had reached the Moon, the Soviet Union's own effort to launch a Moon rocket resulted in two disastrous explosions that put the program years behind schedule. Many engineers working under Sergei Korolev sought a new direction. At the time, their competitors within the Soviet space industry, led by Vladimir Chelomei, had begun developing an ambitious military space station called Almaz. When this fell from government favor, Korolev's engineers proposed combining Chelomei's nascent hardware with a propulsion unit, solar arrays, and other equipment from the Soyuz spacecraft, to form the basis of a purely scientific orbiting outpost. It was suggested this could be launched within a year of approval and before NASA's Skylab. In February 1970, the Soviet government officially endorsed the program, which was code-named DOS 7-K. At the start of 1971, DOS 1, the world's first space station, was ready for launch. On April 19, 1971, DOS 1 was successfully placed in orbit. Shortly before launch, the name Zarya ('sunrise') was painted on the side of the station but the mission staff were told to change this because a Chinese spacecraft had already been given that name. No new name was put on the station but the official Soviet press christened it Salyut 1. The first crew, Vladimir Shatalov, Alexei Eliseev, and Nikolai Rukavishnikov, took off aboard Soyuz 10 on April 23, 1971. In orbit, they docked with Salyut, but the Soyuz docking mechanism was damaged in the process, preventing the crew from entering the station. Fortunately, the Salyut docking port remained intact. The next crew, Georgy Dobrovoslky, Vladimir Volkov, and Victor Patsaev, successfully entered the station on June 6, 1971, and spent a record-breaking 23 days in orbit. However, disaster struck Soyuz 11 upon reentry when a pressure value opened in the descent module allowing the air to escape and killing the crew. 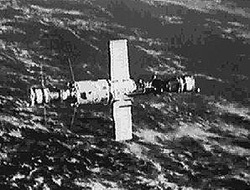 Salyut 1 was abandoned on October 11, 1971, but several successor stations over the next 15 years helped pave the way for Mir. By the end of 1972 a team led by Chelomei had developed the first scaled-down Almaz military space station. However, in order to keep the true nature of Almaz secret, it was called Salyut 2. Legend has it that an embittered Chelomei had 'Salyut' painted on the section which connected to the launch vehicle but was discarded after the craft reached orbit. Following a successful launch on April 3, 1973, the station quickly ran into trouble: its flight control system failed and there was a massive loss of pressure rendering the station uninhabitable. A government investigation into the accident blamed the propulsion system but Western radar provided a vital clue to what had probably gone wrong. Debris in the area of the spacecraft suggested that the Proton rocket's upper stage had exploded in orbit. Almost certainly the station had been punctured by a fragment from the resulting cloud of shrapnel. Despite the failure of Salyut 2, the Soviet space station campaign continued on May 11, 1973, with the launch of DOS 3, just three days before Skylab went into orbit. DOS 3 featured a number of improvements including custom-built solar arrays, which, unlike panels borrowed from Soyuz on the previous stations, could track the Sun and so supply more power to the spacecraft. Yet DOS 3 would never be inhabited. After a flawless launch, errors in the flight control system, which occurred while out of the range of ground control, caused the station to fire its orbit-correction engines until all its fuel was exhausted. Since the spacecraft was already in orbit and had been registered by Western radar, the Russians disguised the launch as Cosmos 557 and quietly allowed it to reenter and burn up a week later. The second Almaz, under the cover name 'Salyut 3,' was successfully launched on June 26, 1974, and its inaugural crew, Pavel Popovich and Yuri Artyukhin, docked with the station on July 3 for a stay lasting a couple of weeks. The next crew headed up on August 26, 1974, and immediately almost met with disaster. A failure of the Soyuz 15 rendezvous system caused the spacecraft to approach the station at a catastrophic 72 kilometers per hour. Fortunately, the spacecraft was also about 40 meters off target and the crew were able to abort the mission and return safely home. 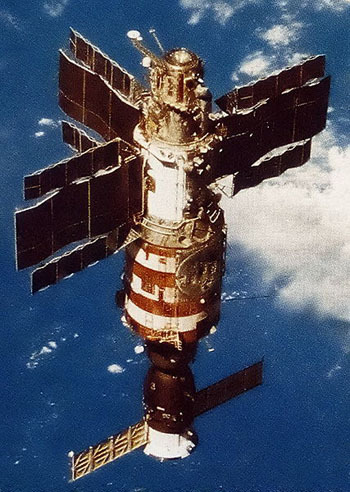 The third and last military space station, launched on June 22, 1976. Two crews visited Salyut 5, in July-August 1976 and February 1977. In between, another crew was launched aboard Soyuz 23 but never docked with the station due to a failure of the rendezvous system. The crew landed in the half-frozen Lake Tengiz, and were only brought to safety after a long and dangerous rescue effort. On September 29, 1977, Salyut 6 successfully reached orbit. Although it resembled its Salyut and Almaz predecessors, the spacecraft marked a revolution in space station technology. First, it sported a second docking port in the rear which allowed two spacecraft to dock to the station. Furthermore, the rear docking port enabled an unmanned, cargo version of the Soyuz spacecraft, known as Progress, to refuel the station's propellant tanks. The Progress ship could also carry food and supplies to the station, enabling crews to stay much longer, and use its engines to boost the station to a higher orbit. These upgrades had an immediate effect on space station operations. From 1977 until 1982, Salyut 6 was visited by five long-duration crews as well as 11 shorter-term crews, including cosmonauts from Warsaw Pact countries. The first long-duration crew on Salyut 6 broke a record set onboard Skylab, staying 96 days in orbit. The longest flight onboard Salyut 6 lasted 185 days. The fourth Salyut 6 expedition deployed a 10-m radio telescope delivered by a Progress ship. After Salyut 6 manned operations were discontinued in 1981, a heavy unmanned spacecraft called TKS, developed using hardware left from the canceled Almaz program, was docked to the station as a hardware test. This type of architecture would be used on the Mir spacecraft years later. When the sixth spacecraft in the pre-Mir space station program was deorbited on July 29, 1982, the Soviets already had a new station in place – Salyut 7, which had been launched three months earlier. The design of this latest station's solar panels allowed for the installation of additional sections to increase its power supply. Soviet designers also hoped eventually to equip Salyut 7 with complex electrically-driven wheels, known as gyrodines, to allow the station to orient itself without propellant. Designers expected the gyrodines to be sent to Salyut 7 aboard a special module that would also carry a permanent astronomy payload called Kvant 1. 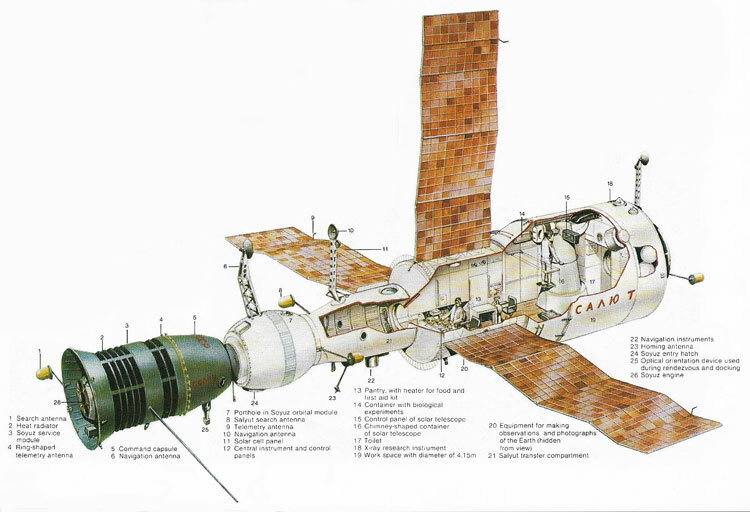 Delays in development, however, kept Kvant 1 on the ground until Mir was launched. However, Salyut 7 crews further pushed the limits of human spaceflight. By 1986, four long-duration crews and five shorter-term crews had lived aboard the station. As is often the case in space exploration, some of the most valuable lessons of Salyut 7 came from its failures. One day in September 1983, fuel started spilling from a propellant line, apparently because of a meteor strike. The crew working aboard Salyut 7 in 1984 performed surgical work outside the station, isolating the damaged portion of the line and installing a bypass section. On February 11, 1985, as Salyut 7 was flying unmanned, a ground controller accidentally cut off communications with the station leaving it out of control and disabled. All that could be done was to track the station's position with defense radar. A rescue crew, including Vladimir Djanibekov and Valeri Savinukh, was launched on June 6, 1985. For the first time, a crew manually docked to a totally disabled space station. When the cosmonauts entered the station, they found their future home with no lights, heat, or power. Large icicles hung from the life support system pipes, and all water aboard the station had frozen. As the cosmonauts' own limited supply of water and food was running out, it took an intensive effort to rehabilitate the facility. By the beginning of 1986, Salyut 7 was back in working order. Meanwhile, at Baikonur, preparations were underway for the launch of a new space station – Mir.